Ubirr is one of Kakadu’s oldest Aboriginal occupation sites open to the public. It's home to an amazing array of well preserved Indigenous rock art dating back thousands of years. Ubirr is located in the East Alligator region of Kakadu, in the northern section of the Park, about 40 km from Jabiru. It's a must for most visitors to the world-heritage listed National Park and you'll find it included in most Kakadu tours. 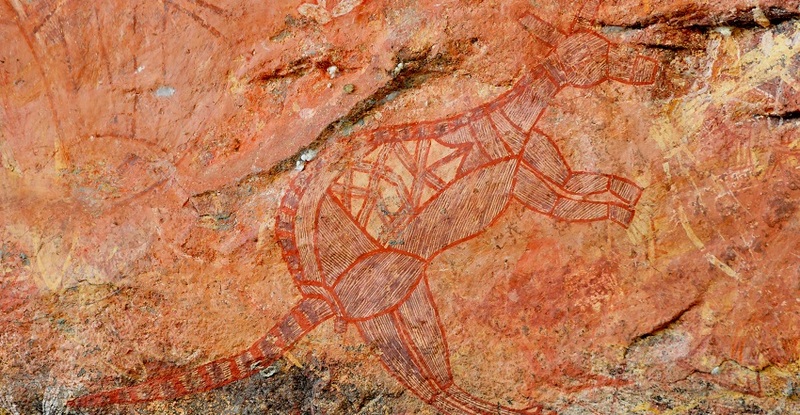 There is also a painting of a Tasmania Tiger or Thylacine, which has been extinct on the mainland for 2000-3000 years, giving you an idea of how old this painting must be. There are also many pictures of kangaroos, turtles and fish highlighting the abundance of food in the region. One of the main galleries is the sacred Rainbow Serpent gallery. This place was traditionally a female only site but the traditional owners have relaxed this rule for non-Ingenious visitors. This site was said to have been visited in the dream-time by 'Garranga’rreli', the Rainbow Serpent. On this visit she sang, bringing the people, animals and plants into existence. This song line, is still sacred to the Indigenous people of the region today. Ubirr is not all about the rock art, a walk to the top of the rocky outcrop offers spectacular views across the Nadab floodplain into the stone country of Arnhem Land. The climb is steep in parts and not for everyone but if you've got a good level of fitness you'll be fine. It's a particularly popular spot at sunset each day. You may remember the view above from the movie Crocodile Dundee which was shot here back in the 80's. While spending time wandering through the many galleries make sure you keep an eye out for the elusive short-eared rock-wallaby. If you see one of these cute little critters chances are it will be under a rock wall or crevice escaping the heat of the day. The photo below is a great example of what we're talking about. Whether you are looking to get a glimpse into ancient Aboriginal culture or just enjoy the picturesque scenery, Ubirr is a place you want to visit. If you'd like additional information about Ubirr or would like to join a Kakadu tour which visits this specail place then please email or call Venture North on (08) 89275500.